Throughout history, there have been different forms of art that have evolved due to changes in our society. One of the new popular types of art that has been introduced within the industry is the form of digital art. With digital art, art is visually seen from a new perspective which expands the user experience. The creation of digital art is now possible thanks to emerging technology, the Internet, and software programs. New forms of technology allow artists to explore and expand their creativity in order to develop thought provoking artwork. Besides the creation of digital art, technology has also provided the security of an artist’s ownership and created a greater sense of transparency for selling art. The art industry is changing due to recent innovations in technology. Now that individuals have greater access to art, there has been an increase in the amount of galleries showcasing digital artwork. It has also now become easier to confirm the authenticity of artwork. The marketplace for art buyers has grown due to the possibility of online auctions. The rising number of galleries showcasing art (including digital art) assists in increasing the publicity of an artist and allows the public to experience something new. With the development of blockchain technology, verifying and purchasing the authenticity of original artwork for buyers has become easier. There are many galleries that display artists’ digital work, which utilizes various types of technology. Innovative art designs utilize equipment, such as LED lights , crystal screens, computer sensors and 3D printing. These types of equipment are needed to showcase an artist’s concept for a particular work of art or sometimes even technology itself is utilized as a part of the art. Formlabs and Pixologic have collaborated with one another to give artists the tools to bring sculptures to life. 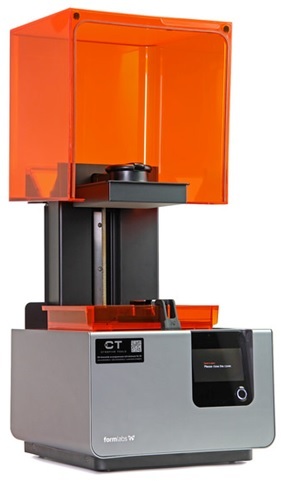 Formlabs developed the Form 2 3D printer while Pixologic created the ZBrush. Both of these technologies are integrated into one system ; artists can utilize ZBrush to design and send their creation to Preform’s software through a 3D printing bridge. The software is used to finalize the design, which can then be wirelessly sent to the Form 2 3D printer. The combination of these modern devices allows artists to effortlessly develop their designs and create sculptures in one simple process. Patrick Tresset is a unique artist from London who has constructed robots to create portraits. Tresset spent around a decade developing his robots , which are known as Paul and e-David. He specifically designed the robots to have a camera to generate an image of the particular subject and a robotic arm to create the portrait. 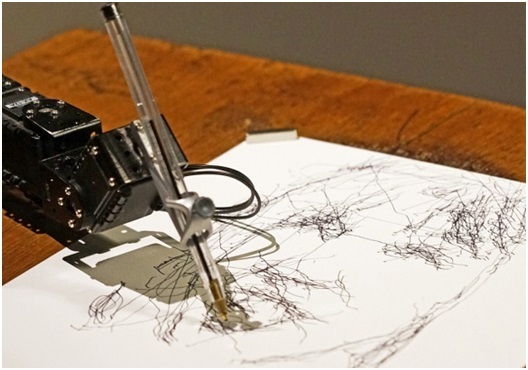 The robotic arm was constructed with joints for various forms of mobility in order for the pen to move in any direction, including raising or lowering the pen. Specifically, the e-David robot was constructed to hold up to five brushes offering a greater number of painting options and colors to utilize for a piece of art. In Menlo Park, California, teamLab and Pace Art + Technology developed an exhibition during 2016 showcasing digital artwork within a 20,000 square foot area. In particular, there was a showcase displaying a digital butterfly exhibit. Digital butterflies were displayed throughout the room and in real time the patterns would change on the butterfly’s wings. Virtualized art was able to be constructed due to the assistance of modern technology. The Color Box was designed as an interactive art experience for individuals. The Color Box is essentially a room where individuals can experience changing colors and lights. Different visual displays are shown and viewers are meant to feel like they are a part of the art. To create this display, projectors, technology switchers, video software, lighting, a computer and cables are utilized. 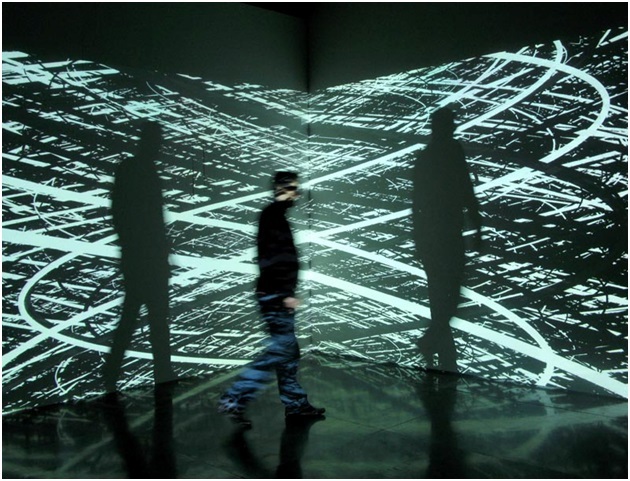 Incorporating these types of technology results in a unique experience for viewers to receive a different perspective of art. Dell and Mashable partnered up to showcase art through a digital presentation by utilizing Dell laptops. Dell displayed various artworks through their new XPS laptop. The laptop features a virtually borderless InfinityEdge display which was showcased on a larger laptop that was built just for the event. The laptop was built to provide an interactive experience, so viewers could step across the keyboard and see the artwork displayed across the laptop’s screen and onto the walls. Besides the huge interactive laptop, there were multiple XPS Dell laptop products positioned across the walls to display artwork from various artists. Based in New York, Meural is a digital art company who began selling their Meural Canvases in 2015. With the help of angel funding from numerous investors, their business was able to expand. The product contains a built-in ambient light sensor and an anti-glare matte display to properly showcase digital art in any setting. The showcase of art can be determined through an interactive experience or controlled from Meural’s application. The ease of digital art offered by Meural Canvases is due to its connection to the internet, its built-in memory, and energy efficiency. The internet allows users to add their desired art and update it at any time. The device has 8GB of memory allowing the storage of approximately 2,000 pictures. Meural Canvases are also energy efficient due to its design of consuming a lower amount of energy. Besides Meural of New York, there are other companies, such as Electric Objects of New York, and Art.com of California, who are also involved in developing and selling digital art frames for users to purchase and display artwork. Each company offers a product that has the same concept of displaying digital images, but differs in relation to certain specifications and features for each product. Blockchain is essentially a network that all users can access and is being utilized within the art industry. This form of technology is useful in providing security for payments and managing data by tracking past transactions. A blockchain consists of a data structure that allows it to create a digital ledger of transactions and distribute it among a network of computers. Algorithms are utilized to analyze a potential transaction and a large amount of nodes (computers) within the system are utilized to determine if a transaction is valid. Within the art industry, there is a large problem with usage rights of an individual’s original artwork. The authenticity and ownership of an artist’s work is important because an artist deserves to be recognized for their work. With the implementation of blockchain the authenticity of a product can be verified. Bitcoin technology relies on a blockchain ledger and is normally used for the exchange of currency. In the art world, a similar concept is utilized where Bitcoin can be utilized instead of a paper copy of a license to determine the authenticity of a piece of art. Authenticity can be confirmed by utilizing a hash value, which is a set of cryptographic functions that allow individuals to identify a set of data. The hash value essentially allows buyers to determine that the art they are buying is licensed and actually created by its original artist. Blockchain technology offers many benefits to artists as well as buyers. One of the main advantages of blockchain and bitcoin technology is allowing the digital art world to expand within the art industry. There has been an increase in the popularity of digital art within the art industry which will only continue to grow in the future as technology becomes more advanced. Advancements in technology not only affect the way digital art is portrayed, but can affect the authenticity of artwork and how art is purchased as well. Companies involved with the development of innovative and unique designs within the digital art industry are eligible to obtain the R&D tax credit.